The variability of enrollment and coverage options in statewide health insurance marketplaces has been a long-standing challenge with the Affordable Care Act (ACA). Rural areas, which are often areas with a low number of insurers, have an especially hard time enrolling individuals in healthcare plans through the ACA. The recent repeal of the individual mandate will make enrollment efforts even harder, while driving up premiums for those who do opt for coverage through the ACA marketplace. While I understood this basic flaw in the current healthcare policy, it wasn’t until I had a personal experience with the exchanges that I truly saw how unsustainable our current system is. After returning from several months out of the country, my husband and I needed health coverage, so we signed up on healthcare.gov and put in his family’s address in Caroline County — a rural area outside Richmond, Virginia. While we expected that there would probably not be a lot of options, especially compared to our previous address in Northern Virginia, we were both shocked by the results. There were only two insurers and eight plans to choose from. All of them included a deductible and charged exorbitant rates for two people in their thirties. Since we are moving to Pittsburgh, PA (Allegheny County) early in 2018, we decided to look up the rates for a similar silver-level plan in that marketplace and we found that the premiums are almost half of that in the rural Virginia exchange. In addition, we could easily select a zero-deductible plan, instead of the hefty $3,600 deductible we were saddled with in the previous plans. So what was the big difference in the Pittsburgh marketplace? There are four times as many plans available, with a greater number of enrollees ensuring a diverse mix of health levels (i.e. not just insuring older, sicker populations). Had we been stuck with the rural exchange options long-term, a silver plan would cost us $18,000/year. Considering that the median household income for Caroline County is just over $57,000, the average couple would be paying 31.5% for health coverage (not including any prescription drug costs or co-pays). 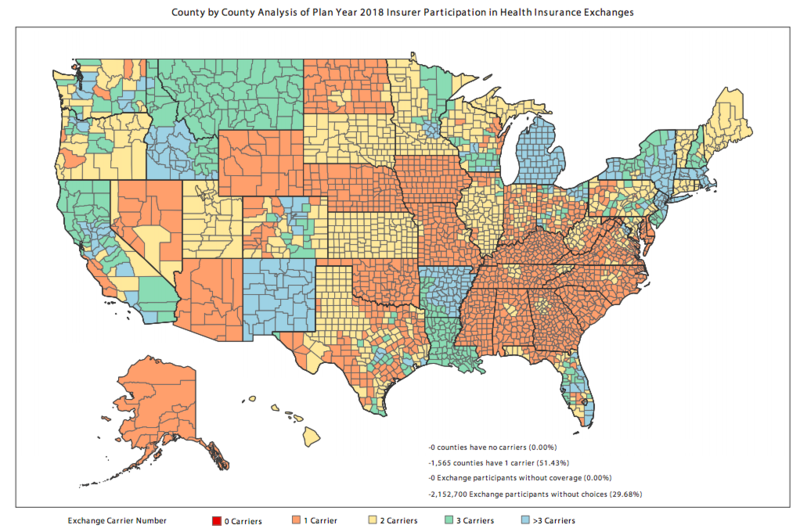 Sadly, the story is even worse in single-insurer counties, which now make up more than half of the counties in the US. 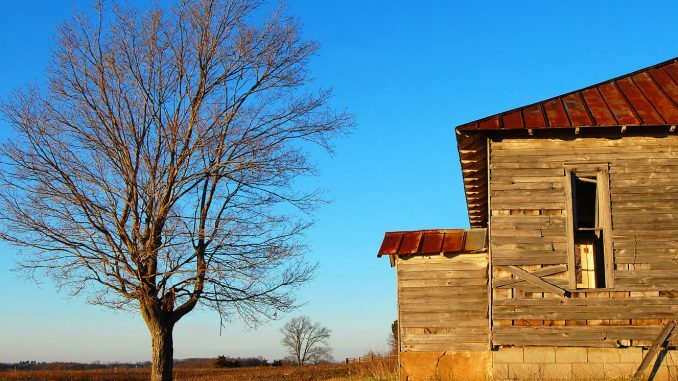 Rural areas are hit especially hard as they tend to have lower median incomes and end up paying a much larger share of their income towards health coverage than in urban areas with more coverage options and higher incomes. Alabama residents, for example, are only able to purchase ACA plans through Blue Cross Blue Shield (BCBS), who requested a 15% increase in premiums for the coming year. • 51% of all counties have only one insurer. • Single-insurer exchanges will see a 30% increase in premiums. • In 2018, 30% of exchange participants will have only one choice. • 43% of exchange participants will have fewer insurers to choose from in 2018 than in 2017. Repealing the individual mandate would cause 13 million fewer Americans to be insured in 2027 compared with current law. The CBO also predicts that premiums in the markets would spike 10% in most years of the next decade without the ACA’s individual mandate as the exchanges are left with a sicker consumer pool. President Trump has recently touted that the new tax bill essentially repealed the ACA, and while this is not exactly true, the repeal of the individual mandate is certainly a death knell for Obamacare as we know it. Instead of watching insurers flee the marketplace or drive up prices for people who can no longer afford healthcare, we need to scrap the market-based approach and look towards a public health insurance option (similar to the current Canadian system) that would offer basic universal coverage and shift the focus from profit to quality care. Otherwise, we will be stuck in a system that shuts out people in need of care while rewarding companies who price-gouge poor, sick Americans.